1960 Top 20 Hits. 1960 Top Music Hits. Just the thing to get an anniversary or birthday party into high gear, this CD with music of 1960 will be a much remembered gift! The list of 1960 top hits will get people thinking about "when they were young" and tapping their toes. Our 1960 song list includes: Big Iron (Marty Robbins), Blue Angel (Roy Orbison), Delaware (Perry Como), El Paso (Marty Robbins), He�ll Have To Go (Jim Reeves), I Enjoy Being A Girl (Pat Suzuki), It�s Now Or Never (Elvis Presley), Misty (Johnny Mathis), Only The Lonely (Roy Orbison), Please Help Me I�m Falling (Hank Locklin), Put Me In That Dungeon (Charles Mingus), Somewhere (Dave Brubeck), Stairway To Heaven (Neil Sedaka), Standing On The Corner (The Four Lads), Teensville (Chet Atkins), The Best Is Yet To Come (Tony Bennett), The Big Hurt (Maureen Evans), The Pan Piper (Miles Davis), Theme From "A Summer Place" (Percy Faith), Things Ain�t What They Used To Be (Duke Ellington). 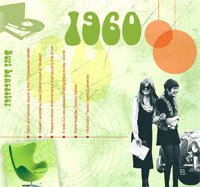 Twenty 1960 songs in all! See also our other 1960 gifts.